Reprinted with permission of the Daily Hampshire Gazette. Growing up the son of a farmer in small-town Mississippi during the Great Depression, George Wardlaw (MFA 55), acclaimed artist, sculptor, painter, silversmith and jewelry maker, never dreamed he would be where he is today. Having a love of art from the time he was a young child, Wardlaw gleaned an affinity for colors, shapes and patterns from his mother’s quilting as well as drawing in his spare time. A native of Baldwyn, Wardlaw (MFA 55) attended Baldwyn High School but didn’t receive his high school diploma until May 2015. In 1945, two months prior to graduation, he joined the U.S. Navy where he served for approximately one year. After being discharged from the Navy in 1946, Wardlaw returned home to work on his father’s cotton farm when one day fate and good fortune aligned. Within two weeks Wardlaw enrolled in the Memphis Academy of Arts (Memphis College of Art) to pursue a Bachelor of Fine Arts degree. After receiving his B.F.A. in 1951, Wardlaw quickly gained a national reputation in metal work, jewelry and silversmithing. In January 1952 he was asked to join the faculty at Ole Miss to establish and teach a metals program for the Art Department. It wasn’t long before he decided to pursue a Master of Fine Arts degree at the university. 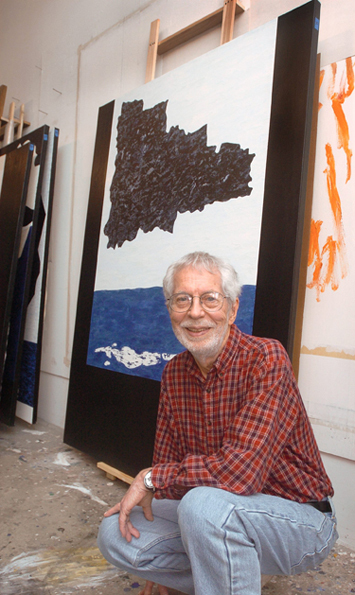 Wardlaw credits two artists in particular that largely influenced his life during his time at Ole Miss. Wardlaw also credits William Faulkner, who was awarded the Nobel prize for literature in 1949, with influencing both his work and many artists both in Oxford and around the world. Currently hosting two exhibitions in Jackson including a retrospective 1954-2014 at the Mississippi Museum of Art and a gallery exhibition at Fischer Galleries, Wardlaw continues to be an active artist painting daily. George Wardlaw is a Member of the Ole Miss Alumni Association. George, Ole Miss thanks you.